Historic Shelby Place Online Auction — Harritt Group, Inc.
10% Non-refundable down payment due day of auction, balance due in 40 days. Taxes prorated to day of closing. Possession at closing. Selling as is without contingencies, all inspections welcomed prior to the auction. Final bid subject to seller’s reserve. 10% Buyer’s Premium. Payment by cash or check, credit card with 3% convenience fee. 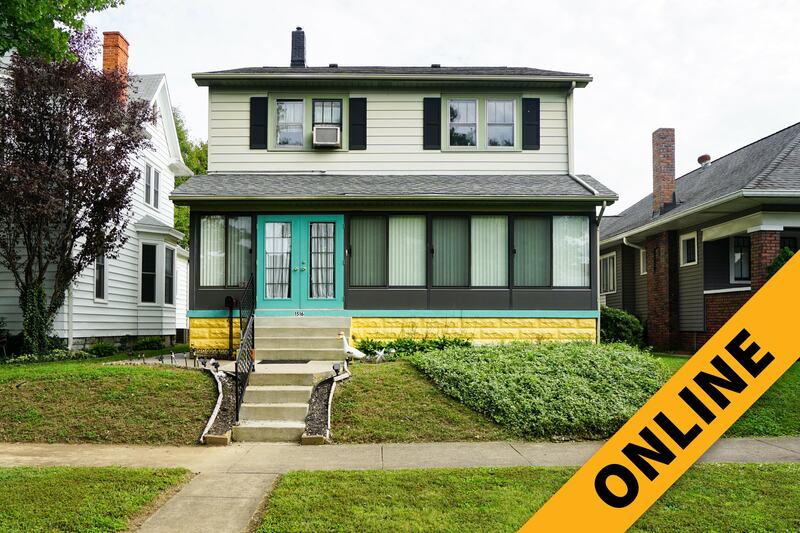 Selling online an early twentieth century American Foursquare home in the historic Shelby Place neighborhood of New Albany just minutes to downtown near schools, shopping, and food destinations. Also selling a collection of antique & modern furniture, collectibles, and household items. Built-in 1925 and family owned for over 50 years this spacious two story 4 bedroom home with oversized two-car detached garage is located in the historic Shelby Place neighborhood just minutes to downtown. A well-crafted 2002 square foot home still retains its original craftsmanship with gorgeous and intricate wood floors, glass door built-in cabinets, period staircase with landing, high ceilings, large closets and more. The first floor features a spacious foyer, living and family room with craftsman column room dividers, office nook with half bath, dining room with built-in china cabinet and swinging door and equipped kitchen. The second floor includes a full bath and 4 bedrooms with large closets and original wood floors. An additional 952 square feet in the unfinished basement has a shower unit, a laundry hook-up, plenty of storage with outside entry. An excellent property featuring an enclosed climate control front porch with large sliding glass windows, high-efficiency gas furnace, window air units, a charming courtyard with privacy fence and a detached garage with alley access. Do not miss this one of a kind buying opportunity. 1800’s furniture includes walnut blind door corner cupboard, cherry cannonball bed, several two-drawer, and one-drawer stand tables, round candle table and washstand table, Victorian furniture includes walnut knockdown wardrobe, washstands, bookshelf, coat & hat rack and lamp table, grain painted eight panel sliding interior door from St. Mark’s Church in New Albany, IN, butcher shop hanging paper rack with shelf and iron brackets, holy water font with removable marble top, 1960’s maple drop front secretary desk, 1960’s maple four drawer chest, (3) ladder back hickory woven bottom chairs and a cedar chest. Iron and wood oak breakfast table with 4 iron chairs, burled maple bedroom suite with five drawer dresser and queen size bed, maple full size bed with mattress and bedding, green and white plaid traditional sofa with pillows, bookshelf, (2) hunter green Queen Anne wingback side chairs, plum Queen Anne wingback chair, drop leaf accent table with butcher block style top, floral print sofa sleeper, small office desk table, Craftmaster traditional sectional sofa, mission style two-tiered stand table, oak daybed with Serta twin size mattress and a twin folding cot. Vintage Hamilton No. 992 stopwatch with original box, ladies 14K white gold band, ladies ring with gemstone, .925 cat in the fishbowl brooch, .925 necklace and pendant (pendant not marked silver), .925 silver ring with purple gemstone and sterling silver ring with heart gemstone, large selection of costume jewelry including faux turquoise, 40+ necklaces, 40+ bracelets, 20+ pieces of faux pearls, dozens of rings and earrings, 13 quartz watches, 6 cameos, vanity boxes and more. (20) Silver quarters including (1) Liberty and (19) Washington quarters, (31) Mercury dimes, (55) Roosevelt silver dimes, (34) 1965-1969 Roosevelt dimes, 1921 Morgan dollar, drilled 1943 Liberty half dollar, 1893 Columbian Exposition half dollar, foreign money and more. Antique electrified hanging oil lamp with hand painted shade & prisms, Aladdin brass electrified oil lamp and several other brass electrified oil lamps, (8) collectible Barbie Dolls, reproduction Verichron quartz wall clock, Seth Thomas mantle clock, large assortment of decorative iron yard art, large assortment of framed wall art including wildlife prints, vintage New Albany prints, William Hancock print, floral prints, (4) John Audubon duck prints, (2) Warren Kimble prints, 1926 Southern Indiana Fox Hunter Association black and white panoramic photo in Bloomington, IN, Evangel Tabernacle panoramic black and white photo dated 1979, modern home decor items, (2) vintage stained glass hanging lamps, decorative painted plates, antique beer steins, stoneware mugs, large selection of decorative vases, sad iron, retro iron whistle, milk glass, New Albany Park Christian Church plates, collectible green glass, animal figurines, vintage cigar boxes, vintage salt, pepper, sugar and flour shakers, purses, large collection of vintage books, metal “No Parking” signs, cast iron floral doorstop, wood butter churn, (2) vintage New Albany High School varsity letters, Regency style circular eagle mirror, vintage hanging paper Santa Claus, Sears stainless flashlight, Band Aid tin, Lincoln log set, vintage LP records, Keystone 8mm camera with leather case and more. Landscaping and yard tools including hedge trimmers, limb loppers, tarps, push lawn seeder, Weed Eater electric blower and steel hand truck, galvanized pieces, vintage 7′ folding ladder, several aluminum folding and step ladders, gardening supplies, large assortment of hardware and tools including painting supplies, electrical cords, hand tools, twine, cleaning chemicals and much more, light bulbs, drink coolers, luggage, handicap medical seats and equipment, fans, cleaning supplies, plastic trash cans, large selection of plastic storage bins, office supplies, kitchenwares, Christmas decor and more household items. East Spring Street to North on Vincennes Street. 5 Blocks to left on Shelby Place. Home on left of median.